On this screen you can check everything about your storage boxes. Simply access Warehouse > Storage Box. Note: Make sure you have selected the right warehouse you want to see first. Once the screen loads, you will see a list of all storage boxes in that warehouse followed by three icons, a few filters and the search bar on the top. The filter and search bar on top are there to give you a hand in filtering storage boxes to be displayed by a determined criteria. The icons close to the storage boxes on the list are: view, unload and check. 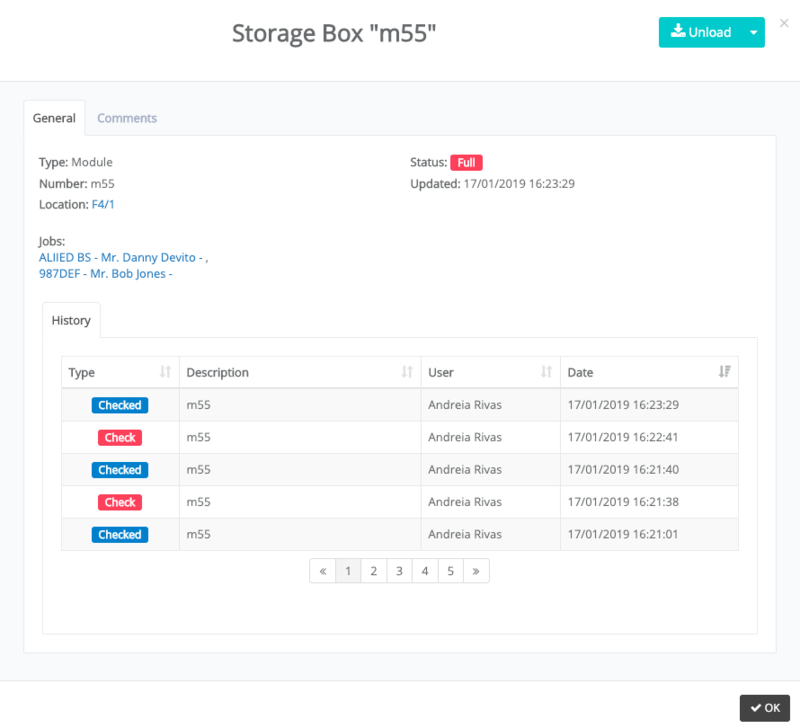 If you want to check further details about your storage boxes click on view icon, a new screen with infos like location and jobs will be displayed. There will also be a tab for 'comments' where you can insert info about that storage box or the jobs loaded into it. The third and last icon is the 'check' icon. Just like the 'unload' icon it's pretty straight forward: you select it if you need your warehouse staff to check that storage box for any needed reason like: check jobs, check if storage box needs maintenance , check if the barcode is correct, etc. Once they have verified it, you can go back to the storage box and add a comment and uncheck. This action will be forever kept in the history.